This week, our team squares off against Team Origin in The 1851 Cup, a match racing regatta on the Solent between the two teams in our V5 Cup sloops. Racing begins tomorrow and runs through Friday. The highlight of the regatta is a race around the Isle of Wight on Thursday, retracing the famous 53-nautical-mile course of 1851 that started a legend. 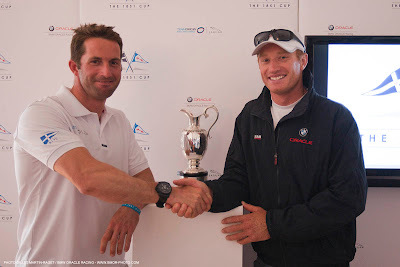 The regatta features two of the youngest, most talented skippers in yacht racing: our very own Jimmy Spithill (31), the youngest winner of the America’s Cup, and Team Origin’s Ben Ainslie (33), a triple Olympic gold medalist. We’ll save the superlatives about “sparks flying” and “chomping at the bit” for later and instead present Jimmy’s take on the week ahead. Ben and I worked together for a short time at the OneWorld America’s Cup campaign for 2003. I’ve got to know him better since then. We’re pretty good mates but, actually, over the past couple of years I’ve hardly raced him at all. We’re pretty similar, both very competitive. He wants to win as much as I do, which is saying something, so we’re pretty intense about our work. Ben’s proved himself to be one of the best sailors in the world. I certainly have huge respect for him. It’s been harder than I thought it would be. You expect to come back to the same level quite fast but it takes time. It’s the small details that matter. It’s why this 1851 Cup series is so good for us. TeamOrigin is a fantastic team with some of the best sailors in the world, and I have no doubt that they will be right up there challenging when the next America’s Cup comes around. It’ll be difficult because I’ve not sailed a whole lot at Cowes. It’s not just Ben and TO we’ve got to deal with, it’s the tides, the winds, the tankers, the other classes. So many different elements make it such a challenge. But I was brought up sailing in Sydney harbor so I’m good at dodging ferries, which is something. Plus our navigator, Ian Moore, lives on Cowes. Along with him, JK (John Kostecki), Rosco (Ross Halcrow), Cheese (Dirk de Ridder) and the rest of the crew we have a group that has spent countless hours on these waters, so we won’t be lacking experience.